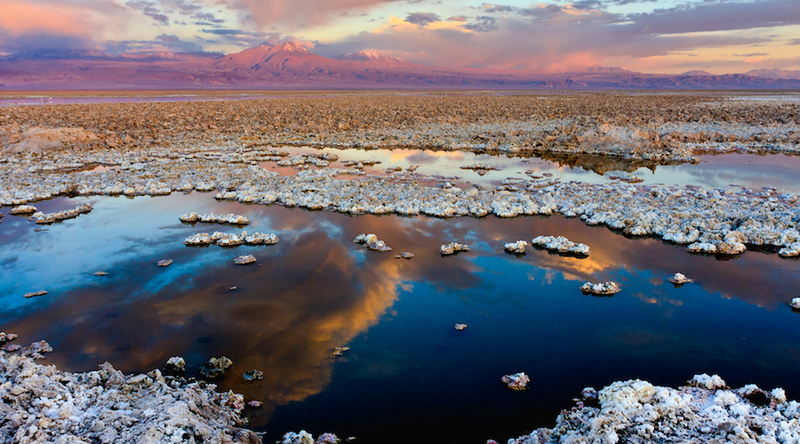 Salar de Atacama, the largest salt flat in Chile. Photo from WikiMedia Commons. Albemarle Corp, the world's largest lithium producer, on Wednesday posted quarterly profit that rose more than expected due in part to price hikes, though unexpected production problems cut its output of the white metal. Albemarle has been striving to boost production and prices of lithium, a vital material in making electric vehicle batteries. It has dedicated profit from its two other chemical divisions to bolster lithium operations. The company posted third-quarter net income of $129.7 million, or $1.20 per share, up from $118.7 million, or $1.06 per share, in the year-ago period. Excluding one-time items, Albemarle earned $1.31 per share, beating analyst forecasts using that measure of $1.25 per share, according to IBES data from Refinitiv. Lithium prices rose from a year earlier and the company is making "meaningful progress on extending our long-term lithium supply agreements," Chief Executive Officer Luke Kissam said in a statement. Unlike some rivals that focus on selling lithium on a spot basis, Albemarle has largely pursued long-term contracts that guarantee its profits and supply for customers . Lithium sales in the quarter, though, rose less than 1 percent to $270.9 million, as production slipped due to "unexpected shut downs at three of our lithium manufacturing sites" that have since been rectified, the company said. Albemarle has claimed that it developed a unique process that would more than triple its lithium production from Chile's Atacama desert without using more water, an assertion drawing increased scrutiny from regulators and investors pushing for more details. Albemarle confirmed its full-year 2018 forecast for sales of $3.3 billion to $3.5 billion, which would mark an increase of 7 percent to 14 percent from 2017 levels. Shares of Charlotte, North Carolina-based Albemarle dipped 0.3 percent to $107.64 in after-hours trading, following a slight rise during the trading session. The company plans to hold a conference call with investors to discuss the quarterly results on Thursday morning.